When it’s nesting time for birds along the Gulf Coast, it’s time for humans to keep their distance and to be careful not to disturb them. If you see a group of birds on an island, anywhere between say March and August, and they’re acting kind of conspicuously, they’re probably nesting. And if all of a sudden you see a whole bunch of birds getting up and flying off then you’ve already gotten a little bit too close. David Newstead is an Environmental Biologist with Coastal Bend…Bays and Estuaries. He’s on next week’s Texas Parks and Wildlife TV series on PBS. Nesting is a critical period in the life cycle of the birds. 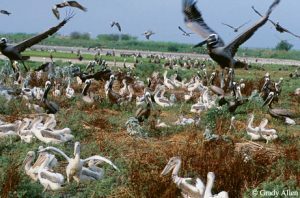 Without a safe place to nest the overall population of coastal water birds will decline. When people get a little bit too close to nesting birds that can have a pretty catastrophic effect on the nesting success of the birds. Getting too close can actually cause a panic reaction and scatter birds. When they move from the nest they are actually leaving those eggs and chicks completely exposed. And birds and chicks, they can’t thermo regulate very well at all so they rapidly overheat. And the eggs of course can’t thermo regulate at all. In this hot Texas heat, in the middle of nesting season, getting birds off of nests and chicks for just a couple of minutes can result in death or cooking of the eggs. They say you can cook an egg on the sidewalk, you’re basically cooking eggs on the island. Check out the segment Guarding the Nest the week of July 8 on the Texas Parks and Wildlife TV series on PBS. Check your local listings. The Wildlife and Sport Fish Restoration Program support our Series. This entry was posted on Friday, July 6th, 2018 at 12:00 am	and is filed under Birding, Conservation, TPWD TV. You can follow any responses to this entry through the RSS 2.0 feed. You can skip to the end and leave a response. Pinging is currently not allowed.